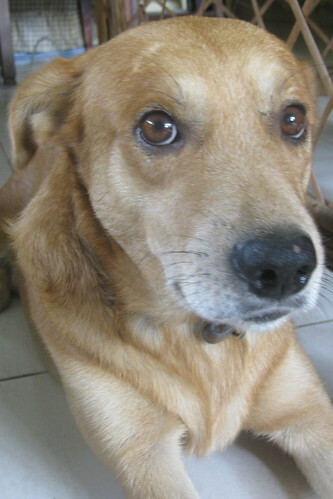 Georg was a street dog. Our chauffeur picked him up at a road side pet market, one of those places with about 40 parrots stuffed in a cage and forlorn monkeys chained to a tree. Georg was probably about 6 months old. Not full grown and quick to learn. Four years later Georg is wise, tolerant, and loyal. 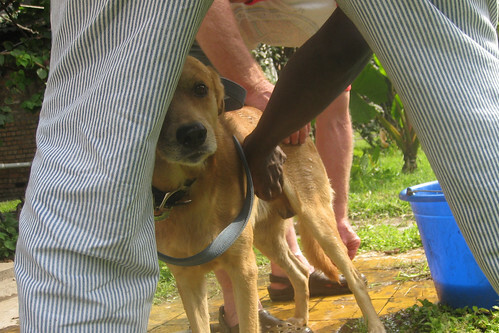 But being a dog in Kinshasa –even a loved dog – is a dog’s life. Papa François, the gardener, warned us to keep him inside the gate. This was the middle of last year. There had been an outbreak of rabies somewhere in Kinshasa and all stray dogs were being shot down by the police. Soon after that Georg had his first explosive botfly infestation. Georg feigned equanimity as John and Michel diligently extracted maggots from skin warbles. Some days they emptied more than 10 and some days more than 20. Were all the botflies of all the exterminated stray dogs of Kinshasa focusing in on poor Georg? I do not even know the life cycle. Does a fly land on Georg and lay an egg? Or does Georg role around in the grass and pick up little instar larvae eager to jump? As there are about 150 species of warble flies in the world and they have different life cycles, we would have to make a real study to learn the life of a Georg fly. Poor Georg, he just had a second infestation. 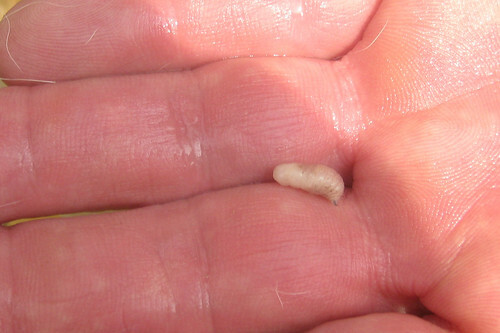 This is the maggot in question — no particularly outstanding features. One thing we know: Georg does not like flies — any flies. He chases after them as though they were thieves. We also know the worst infestations are during the dry season. Now after a series of major rains Georg is free of botflies again. His skin is smooth. 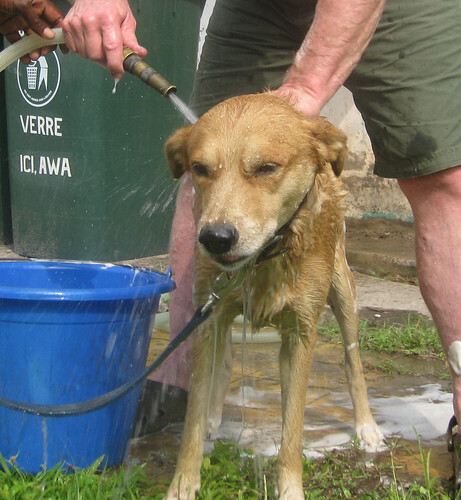 Life in Kinshasa is good – even if it is a dog’s life. Post-treatment bath was not a bad thing on a very hot day. This entry was written by Terese Hart, posted on 2010-02-21 at 9:48 am, filed under Kinshasa. Bookmark the permalink. Follow any comments here with the RSS feed for this post. Post a comment or leave a trackback: Trackback URL. Love this story and the pictures. Thanks. georg! was worried you were going to tell us he is now among the departed — whew. i fell in love with him the first time we went running with john. a sweetheart. He looks like a great dog…So glad he has a good home.. It was such a pleasure to meet Georg: what a wonderful dog: well mannered and undemanding, great with children and other dogs..outclasses any dog I know with a pedigree. Well, you make Georg sound a little too nice!